The photo was published 'New York Times' on 26 March, 1993. The response of the people was overwhelming. Most of them were accusing me for not saving the dying child. Even some of my best friends accused me for the same reason. The responses greatly pained my already wounded heart. 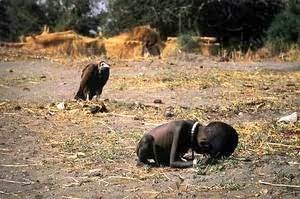 "The Man adjusting his lens to take just the right frame of her suffering must just as well be a predator, another vulture on the scene", comments went on like this. This and other such comments, directly thrown on my face, made me very restless and depressed. My daughter Megan tried to console me as much as she could. But I was sinking into deep anguish. As a photographer I had covered several violent incidents of apartheid in the past. Street fights, shooting, man slaughters, execution, carnages all I had covered with my camera. But never before had I felt such anguish as I feel now. Never had I seen such wrath of public. "Yes I am a sinner. Oh..Jesus, I am a sinner. Don't forgive me for what I had done". "Megan.....Megan". I shouted in agony. She came out running. In a frenzy. I embraced her and showered kisses on her fore-head. 'You always be with Papa....never leave Papa alone....would you, as your Mama did once.' The child stood in aghast, her eyes filling!